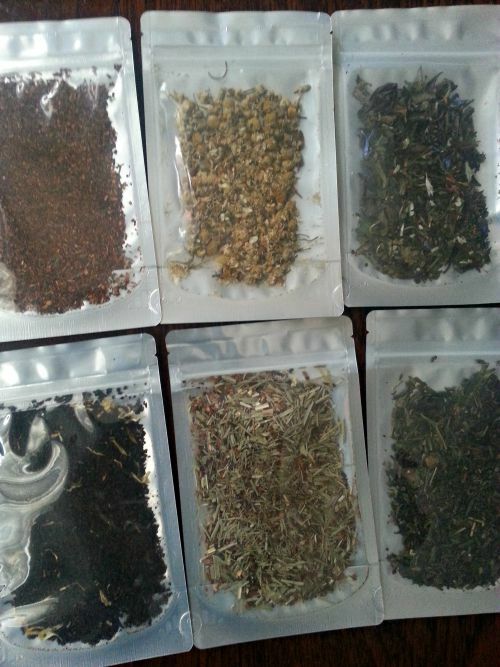 Tealated is an online shop that sells loose leaf tea. They offer many different types of tea. I may be addicted to coffee but I also have a love of tea. In the past I have tried black tea, green tea, and chai tea. I was excited to try the new tea Tealated has given me. Each pouch comes with enough for a few cups of tea. The directions say to use a tablespoon. Each pouch has steeping times on them also. You can use tea bags which can be found here at the Tealated shop. You can choose to shop by tea categories such as black teas, green teas, or many others. 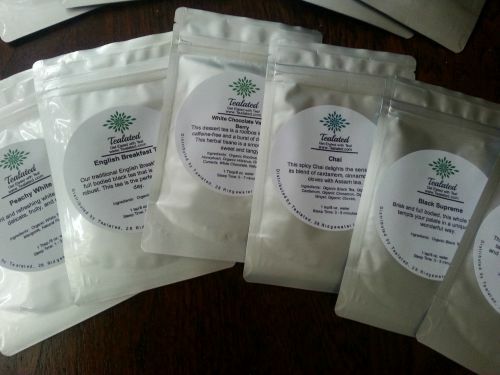 You can also get a tea sampler for yourself or as a gift. The sampler comes with 11 different types of tea. I think this is a perfect gift for a tea lover. Another thing I love about Tealated, besides their tea of course, is they give back. They donate 3% of their sales to Water.org which is a great charity to help find solutions for safe water and sanitation. I think it is wonderful when businesses and brands give back. It makes me happy to shop with them. Another tea I enjoy is Oolong Tea. It has many health benefits and is a tea I can drink without adding anything to it. If you would like to learn more about different teas go to the Tealated blog. You can learn all about each tea you drink. There is something nice about drinking loose leaf tea. It tastes better then what you buy in the store. I think if you never tried tea this way before, you should give it a shot. Tealated is sponsoring a giveaway here on Barefoot and Loving It. You can win a Iced Tea Gift Set.This set comes with a Takeya Iced Tea Maker and Tealated Tea. This is a perfect summer giveaway. I love drinking Iced Tea in the summer time. The winner will also get a digital copy of Iced Tea: Easy, Delicious Recipes, and How To. This giveaway is open to the US and 18+. All entries are optional. Fill out the Rafflecopter below. Update: winner of the giveaway was Sierra. Congrats! For me it would be the Moroccan mint tea and for my mother definitely the organic green tea. I love the flavors of Moroccan food so I definitely feel I would love the spiciness of it in a tea. And anything mint is a high five in my opinion. My mother drink green tea every morning so I know this would definitely be up her alley. I like to try different kinds of tea. This would make a cool gift. I have been a green tea lover for a long time so I would definitely enjoy the green suprise! I would like to try the green delight tea!!! Green tea gives me the boost I need to make it through the day! The Cream of White Cocnut sounds heavenly. I love fruity teas and have been trying to kick my diet soda habit. I would choose the lemon ginger because I absolutely love those flavors together. Peachy White Tea would be a favorite of mine. I like a delicate tea that has fruity notes so this sounds like the perfect tea. I love hot tea and I am always excited to try new flavors! I would love to try the Cream of White Coconut Tea please. I love coconut. Yum!! kristiedonelson(at)gmail(dot)com Thank you. I would love to try Peachy White Tea because white tea is my favorite and I love anything peach flavored! The peachy white tea sounds delicious! I love flavored teas. I love all teas. The Chamomile Herbal is my favorite. id like to try the Beautiful Bloom Tea because I love white tea and have not had one of the blossoming teas before and would like to try it. I would really like to try the Moroccan Mint, I love mint tea because it's so refreshing and helps to calm the tummy. I really would like to try the white coconut, sounds great. I would like to try the green delight tea. Classic Peach Tea or Peachy white. I love Peaches or anything peach flavored. I would like to try classic peach..... i love peach tea. I can't recommend their teas enough! I love Tealated! I'd like to try the classic peach and the chai. The creamy white coconut sounds good too. I've tried their Peachy White tea; it is very good. The Cream of Coconut looks like it would be fantastic iced! I would love to try that me thinks. I'd like Moroccan Mint Tea because I love drinking mint tea everyday. I'd love to try "Green Delight"- I love green tea and that one looks so pretty! I'd like to try the white chocolate berry vanilla herbal one. It's caffeine free and sounds delicious. Hi, has a winner been announced yet? Anxiously waiting!